This speaker worked well at a “Night at the Museum” theme. 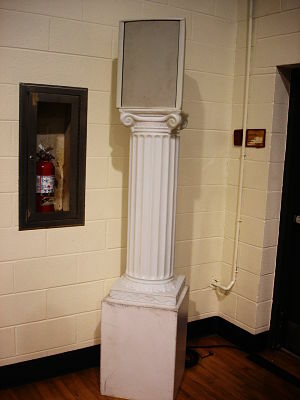 The column with speaker-on-top blended beautifully (even in a school gym). My recent articles in Benefit Auction Ideas (my twice-a-month ezine) have focused on suggestions for great benefit auction themes. In this post, I’m moving this theme concept in a new direction. Some elements of your gala are optional; others are required. Having a theme is optional. Offering items that people want – and guests with money to buy them – is required. A sound system falls into that latter category. It’s required, even for small crowds. Sound systems are usually nothing to admire aesthetically, but there’s nothing to say you can’t get creative and have your sound system support your auction’s theme. And I love the idea that an optional benefit auction element (the theme) is supported by a required element (the sound system). It’s that old adage of killing two birds with one stone. Check with your A/V company to see what’s available. Do they have speakers that resemble something else? Maybe they have speakers that look like boulders, which is perfect for an outdoors-y or caveman theme. What about speakers that conveniently tuck into potted plants or blend into foliage? That would be great for your jungle, tropical, and Hawaiian themes. One A/V company here in the Washington, D.C. area gets a lot of mileage from the speakers in the photo. The company uses these at virtually all benefit auctions held in museums. The round, fluted column pedestal of the speaker matches the Ionic column style found in so many of D.C.’s landmarks (WWI monument, Jefferson Memorial, the White House, countless museums). These also work great in school gymnasiums where they fit in beautifully with a “Night at the Museum” theme. To be clear, I’m just as happy when a client uses “speakers on a stick,” which are those boxy-looking black speakers common at galas. But if you’re trying to visually improve your benefit auction, finding the right audio speakers might be next in your bag of tricks. Another great idea. Who knew? Anyone who runs an auction just has to check out your site. Those are great! I had no idea how many options were available for sound speakers (or all the other great things you’re sharing about auctions too). Thanks for the tips! Kirsten: Yes, who knew? There are lots of cool new things out in the marketplace. How cool is that? Love those speakers! Keep sharing those great ideas Sherry! And this is why you continue to dominate this field, Sherry. It’s the details like you share here that make all the difference in the world for someone’s “experience” at auctions. As the owner of a St. Louis Audio/Visual company, I really appreciate this post! Not only do we carry speakers in several different styles, but we also frequently design and build “camouflage” sound systems that integrate into other props or scenery. I’m sure that the A/V companies in your area would be happy to do the same! “Sounds” (little play on words…) like you’d be a great partner for a group, Collin. If you ever have some funky systems you’re especially proud of (from benefit auctions only, please) send them my way and I’ll post them!